Feels like ages since I last publish any coding base blog, but, finally, today's post is going to be coding base. 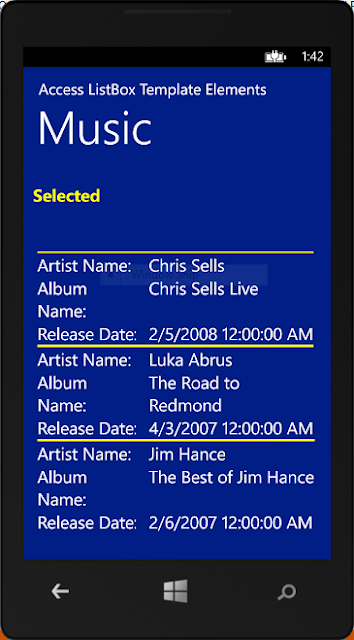 Today, I shall demonstrate how to access Windows Phone platform base list box template elements. Following are some prerequisites before you proceed any further in this tutorial. Accessing a template element of list box is not difficult when you simply map your element to its designated model, but, let say if you want to access the selected element as a visual element like TextBlock, CheckBox etc then accessing a list box element becomes trickier because model mapping only maps text to your designated model, it does not map any of the element property e.g. element styling, events, visibility etc. So, in order to do that let proceed with today's tutorial. You can download the complete source code or you can follow step by step discussion below. The sample code is in Microsoft Visual Studio 2013 and Windows Phone SDK 8 has been targeted. If you choose to follow step by step discussion then do not get worry about the application styling as I am not posting the code for application styling. Now lets begin our coding. 1) Create a Windows Phone (silverlight) application with target of SDK 8 in visual studio 2013 and name it "AccessListboxTempElements". This is a simple list box base template. If you face any styling related issues the remove the styling classes that are not linked in your project. 3) Now create a new model class and name it "MusicRecord.cs". /// Initializes a new instance of the <see cref="MusicRecord" /> class. /// Gets or sets artist property. /// Gets or sets album property. /// Gets or sets release date property. This is a simple model class that we shall be using in our list box template for each element. /// Initializes a new instance of the <see cref="MainPage" /> class..
// Set the data context for the list box. 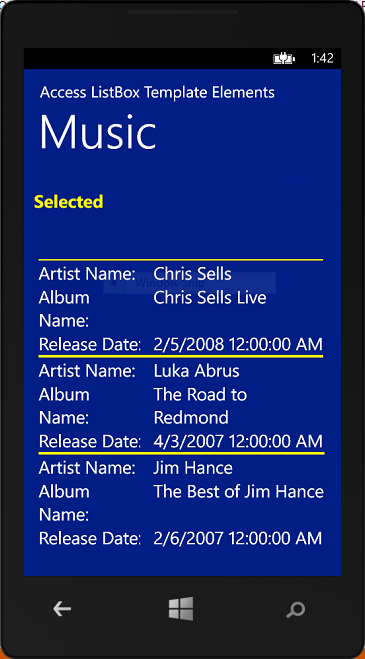 #region Music list selection changed event method. /// Music list selection changed event method. In the above code, we have created a ObservableCollection list called myMusic with each element representing our model structure. Then, in our constructor we have added few elements into the list and finally bind our list to out list box element in view. 6) Execute the project and you will simply see a list displaying the data that we have provided. At this point we are not accessing anything. #region Find visual child method. /// Find visual child method. // Verify if the object contains name property. // Verify if specify object name matches to the require control name. In the above code we have created a selection change event "LstMusic_SelectionChanged(...)" method and "FindVisualChild(...)" method. Selection changed method simply get the selected element, convert it into a FrameworkElement and pass the require information i.e. main container (which is our selected element) & the name of the element (in element template that need to be accessed from list box) into "FindVisualChild(...)" method. "FindVisualChild(...)" method basically searches the element that you want to access by name and return the element handler in a visual element form i.e. TextBlock, CheckBox etc.